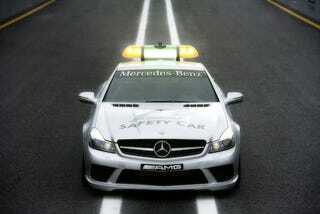 Mercedes has unveiled the official SL63 AMG pace car and C63 wagon medical car for the 2008 Formula One series. The models' first race will be at the Australian GP in Melbourne next week. In addition to copious amounts of safety equipment, the SL63 has received performance upgrades to make it more capable on the track.